I get the 08.44 train from Carmarthen, which has come from Hereford. Surprisingly it has four carriages. It leaves on time and makes its first stop at Whitland. 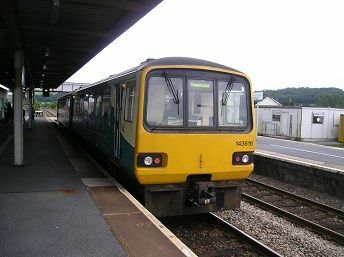 Whitland station has two platforms with the main station building on the up line. Opposite are two blue coloured shelters. For some reason the boat trains to and from Fishguard do actually stop here, but not at the bigger towns of Carmarthen and Swansea. There are a few rusty sidings on the left by the station, which has three platforms, as well as a signal box just before the station on the left. We leave the mainline to Fishguard soon after we leave Whitland about four minutes late and go onto a single track. We cross over a river and then go onto very bumpy unwelded track. The scenery is rolling green hills with sheep grazing in the fields. We are going at around 40 mph in a south westerly direction and seem to be going downhill. After about ten minutes we slow down and come into Narberth station, which has a large white station building with equally large canopy over the platform. The windows are all boarded up of course. There's a large group of children waiting to get on and the train seems to wait for ages here. We then move sharply to the left in a deep cutting, before going into a tunnel. The track then veers to the right and we start to go south. We are now on an embankment with views across the low lying hills on either side. We then go into a cutting, moving quite sharply downhill on welded track. The line flattens out and we are on an embankment again, passing a few houses on the left below us. We speed up to about 50 mph again moving downhill. There are several wooded areas here and we go into a low cutting and then an embankment before coming to a stop at Kilgetty, which has a single platform with blue painted shelter. There is a sole passenger waiting to get on here. There's quite a few houses to be seen on both sides. We leave and go over the A477, still going downhill. We only go for a short distance before we stop at Saundersfoot, which has a wide platform, with a turquoise painted brick shelter. We move into a low cutting onto welded rail, still moving downhill at about 50 mph. Then it's embankment, cutting, embankment, cutting, with steep hills on our left, as the track weaves to the right and the left. Eventually houses appear on the hillsides on both sides and we start to slow down. A rusty track is on the left and we go over a viaduct and come into Tenby station, which is the largest station on the line with three platforms. The main station building on the left is quite large with a canopy. On the other side an island platform also has a large canopy over it, though the third platform doesn't have a track into it. About three-quarters of the passengers get off here, including all the children. We wait for about fifteen minutes here, until the train coming in the opposite direction arrives and then we pull away. There is a caravan site on the right and a golf course on the left, but we don't go very far before we arrive Penally, which has a simple turquoise coloured shelter. There are lots of flowers on display as well as the old station house, which is now a private dwelling. There is a camp site on the right, followed by an army depot and then the train starts going west away from the coast. It's fairly hilly here and there are fields of wheat on both sides. We are doing a steady 40 mph and after a few minutes we arrive at Manorbier, where we almost stop, but don't! It has a nice wooden shelter on its single platform, plus a private dwelling station house. We pass a small lake on the left, but go quite slowly over this stretch as there are a couple of unmarked crossings and the driver has to stop and whistle before proceeding. We then speed up to 50 mph, passing flatter scenery, before slowing again for Lamphey. Again we nearly stop, but suddenly pull away when the driver sees no passengers waiting on the single platform. We don't go very far before we start seeing houses on both sides. We soon arrive at Pembroke station which is high up on an embankment. It has a large dark blue shelter on its single platform. You get a good view of the town below us as the train veers to the right and then goes over the Pembroke River. We go about 40 mph passing houses on both sides and Pembroke castle on the left. We then go into a deep cutting and then a tunnel before emerging into another cutting and the fields on the right. There's several industrial units on the left as we go onto another cutting and then stop at another unmarked crossing. There's houses on the right now and we go a short distance into Pembroke Dock station, which has a large granite station building on its main platform. There is a second platform still in situ, which presumably is there for excursion trains. Sadly there are no toilets or refreshment kiosks, though with trains only every two hours it's hardly surprising.